Please note, before you write that card, CCG callsigns are (very nearly) ALWAYS /P(ortable). We will not normally accept cards to our rawcalls. That will NOT have been the station you'll have worked. Furthermore, CCG callsigns - G0VHF/P and M1CRO/P - operate V/U/SHF only and you are more likely to win the Lottery than work us on 80 metres. Please check the callsign thoroughly before sending a card for HF or LF QSOs. CCG QSL 100% on receipt of card via the Bureau or Direct. (see QRZ.com for our QSL Manager; note that Bureau cards must be sent `via` the manager for each call). The QSL managers are group members, not 'professional' QSL'ers, so please be patient regarding return cards. Apart from QSL'ing duties, the managers devote considerable time to preparation of equipment for contests, setting up the rig for contests, operating in contests and if they have any time left, they go to their jobs to earn their pay! CCG have a different card for each callsign with a full-colour photo - often of one of our rigs set up on site. We obviously cannot afford to ring-the-changes in card design too often but we will try to keep the pictures current. eQSL cards are single-sided so ours have a plain background so as not to detract from the information printed there. If you are a member of eQSL.cc (Membership is free) you'll have noticed that our cards have only "JO01" printed in the body of the card. The exact locator relevant to the contest contact will be printed in the comments at the bottom of the card. 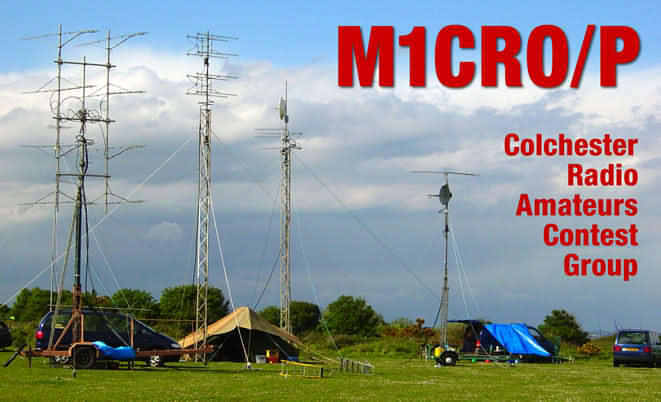 This is because we use a number of sites in deepest Essex, depending on band, conditions and pocket-money so to ensure that you receive a correct confirmation of the actual QSO. Please can you do likewise? A card printed with your QTHR (home) locator is not a valid confirmation of a contact made while you were on a Backpackers trip; qualifying a hill for SOTA; or out /Portable, operating from your favourite contest site. Neither is a card bearing only your rawcall if you were portable, mobile or /A, /MM or /AM; we need to have ~that~ information confirmed. That is what a QSL card is all about! CCG accept that not everyone has the means to send out QSL cards for every contact they make - especially for contest QSOs. So if you would like a card from us for a special contest QSO but do not have a QSL card to send to us in the first place, then CCG will accept a request by email or as a note appended to an eQSL. We will not promise to send cards to requests received over-the-air. This is not fair on you (or us) as promises made during a contest tend to be lost in people's minds or the scrap of paper with your callsign on it is tidied up and thrown away in the effort required to get a ton of gear packed into the vehicles and off the site before nightfall. Or send an eQSL card with a request for a 'HardCard' in the Comment section. 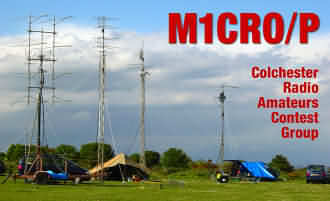 If you email, please include full details of the QSO so that we can check our logs. We will respond with a card, via the Bureau, in our next QSL batch run (usually once a month). If you are not yet a member of eQSL and you have worked G0VHF/P or M1CRO/P, since May 1997 or March 1998 respectively, and have been active in contests since, you can guarantee that there will be eQSL cards waiting for you! It's easy to check. Use the eQSL button on our HOME page and enter your callsign into the popup Search window. You'll be surprised! We regret that eQSLs for contacts made earlier than the dates above cannot be confirmed. Time and changes in personnel means that the logs for previous contests are no longer available. So sorry. Because it is a database, eQSL is strict in handling callsigns correctly. Two eCards, one addressed to G0VHF/P the other to G0VHF, will go to different In-boxes. 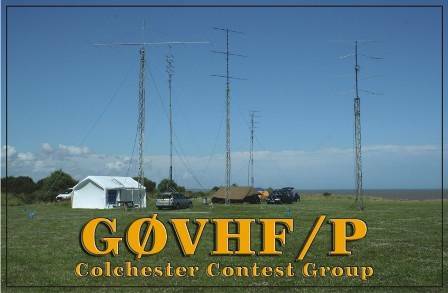 It is important that you eQSL to the callsign that you worked - G0VHF/P (or M1CRO/P). Your card will then marry-up with the eQSL we upload to our Out-box. If we eQSL from G0VHF/P (which we do) and you eQSL to G0VHF the cards will never match. Neither we nor you will get the QSL confirmation of the QSO without some very tedious manual operations. (The same applies for M1CRO/P, of course). And the same applies to YOU! If we work and log and eQSL G99ABC/P but get a card from G99ABC the eQSL database will not match the cards! CCG personnel have written software that reads our electronic contest logs and produces 'ADIF' format files for upload to eQSL. This process takes place automatically from our log-keeper's computer system once the logs have been completed and sent off to the Contest Manager for adjudication. This means that <>500 contest QSOs can be eQSLed in 5 minutes. It also means that you will be sent a card via the callsign that you used in the contest, complete with any " / " modifier. If you have not created an account on eQSL for the modified call (/P or /M, or whatever) you will not see the card in your In-box! Now, we agree that that 'ain't perfect'. Nevertheless, that's the way it is just now. eQSL are aware of the issue and are, as we understand it, trying to devise a sensible method of dealing with it. The underlying issue is that a QSL card, electronic or otherwise, should reflect the true and complete exchange of information during the QSO. It is evident that this is often not the case.